Russia has not indicated a desire to save a Cold War-era arms control agreement amid a looming U.S. deadline to pull out of the pact unless Moscow returns to compliance, according to the U.S. ambassador to Russia. In a press call with reporters Thursday, Jon Huntsman said the United States and its NATO partners have "gone to great lengths to preserve" the treaty, "however no one believes, nor is there any reason to believe" that Russia will destroy the missiles the alliance says violate the pact. 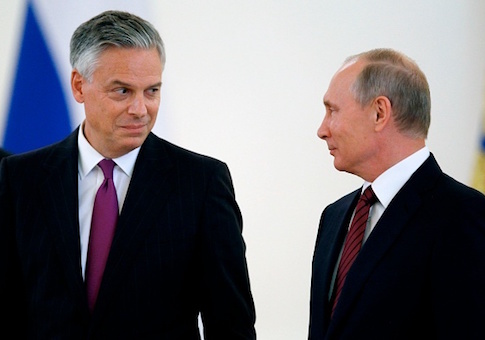 "When you have two signatories to a 30-year old agreement … and you find that today—indeed, over the better part of the last five years, only one of two is abiding by the obligations, it becomes foolhardy to carry on," Huntsman said. Secretary of State Mike Pompeo warned Moscow on Tuesday that the United States would no longer adhere to the accord's provisions if Russia failed to come back into compliance within 60 days. The Intermediate-Range Nuclear Forces Treaty, or INF, signed by the United States and Russia in 1987, bars the Cold War adversaries from possessing ground-based ballistic missiles with a range of 500 to 5,000 kilometers, or roughly 310 to 3,400 miles. The United States has alleged Russian violations of the agreement since 2014. At issue is Russia's development of an intermediate-range ground-launch cruise missile called the 9M729 (or SSC-8) that the United States has said exceeds the range allowed by the INF. Russia has denied the violation. Secretary for Arms Control and International Security Andrea Thompson, who was on the media call with Huntsman, said Russia must get rid of its 9M729 cruise missiles and launchers or alter their range to return to compliance with the INF. Huntsman rejected the notion that the Trump administration's threat to withdraw from the pact represented an "ultimatum" or signified a U.S. abandonment of arms control. "This does not mean we are walking away from arms control," he said. "We are doing this to preserve the viability and integrity of arms control agreements more broadly. We remain committed to arms control, but we need a reliable partner and we do not have one in Russia on INF, or for that matter on other treaties it is violating."